Newcastle is the noisiest urban area in England, with residents facing severe hearing and health problems, according to a new report. 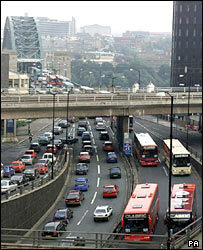 The North East city topped a traffic noise table with 80.4 decibels, said to be the equivalent of a loud alarm clock constantly ringing in a person's ear. Tranquil Torquay emerged as the quietest of the 41 towns and cities surveyed, at just 60 decibels. Other noisy neighbourhoods included Birmingham, London and Darlington. Some relatively small towns, such as Darlington, Doncaster and Gillingham, proved to be louder than major metropolitan cities including Leeds, Manchester, Liverpool, Sheffield and Nottingham. The report, compiled by the Ear Institute at the University College London, and Widex, a Danish hearing aid manufacturer, looked at traffic noise in the towns and cities across England during rush hour periods. Measurements were taken in October and November in a variety of locations in each town and city, at sites where people came into close proximity with traffic. Several readings were taken in each place over a period of 10 to 20 minutes to avoid any inconsistencies caused by, for example, one particularly loud lorry travelling through an otherwise quiet town. The averages of all the readings were taken to find the official reading for that area. It concluded the noise levels uncovered were a threat to health and well-being and should be seen as an issue comparable to air pollution. Report author Professor Deepak Prasher, of the Ear Institute, said: "Noise pollution in our towns and cities is a growing problem and can have a serious long-term impact on our health and well-being. "Noise not only annoys but also can raise our stress levels and associated hormone levels. "It can disturb sleep and increase the risk of heart disease and if the noise is loud enough it can lead to permanent hearing impairment and tinnitus." Although the difference between noisy Newcastle and tranquil Torquay was 20.4 decibels, the hearing experts said that because decibels are a logarithmic index, the results made Newcastle 100 times noisier than Torquay. While Newcastle's noise was compared to an alarm clock in the ear, Torquay's was said to be similar to a normal conversation.